Atterberg�s Piano Concerto begins like Grieg�s, thus setting the pattern for an expansively melodic and noble, heroic work in the grand Late Romantic tradition. There are sideways glances at Tchaikovsky and, in the more introspective and melancholic passages, Rachmaninov is often recalled in the orchestra�s Romantic opulence with the piano intoning bell-like figures in counterpoint. That is not to say that the voice of Atterberg is subjugated; on the contrary his individuality is strong, through the sort of assertive treatment of Nordic material familiar from the symphonies. The Andante begins in hushed stillness in the strings, the momentum picking up slowly with the piano quietly pensive � the bell-like tones are revisited - until a passionate climax is reached with piano and orchestra returning to Rachmaninov territory. The finale, marked Furioso, is the least successful of the three movements. It is a peculiar, uncomfortable mix of galumphing folk material, odd syncopation and jazz inflections, and some self-conscious romance with Rachmaninov waiting for the grand final peroration. 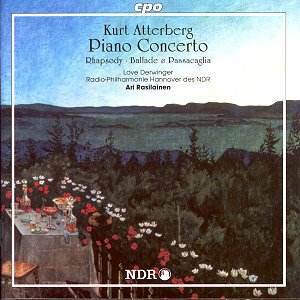 The Rhapsody for Piano and Orchestra is Atterberg�s Op 1 and it shows. That is not to say that it does have charm or fails to grip. It passes through many moods from the grand heroic through dark introspection to carefree high spirits taking in some very oddly accented rhythms, while influences fluctuate between the Nordic and the hot heady Oriental � typified by Rimsky-Korsakov. An interesting oddity. More assured is the Ballad and Passacaglia, subtitled "On a Theme in the Swedish Folk Tone." which was once quite popular. It was premiered in Stockholm, in 1937, by Eugene Ormandy. It is something of a short symphony in structure. The opening movement has plenty of bravado and one is reminded of the storm movement of Atterberg�s Symphony No. 3 "West Coast Pictures". A lovely lyrical episode follows as a �slow movement�; the cheeky scherzo section is extraordinary, it sounds like a clog dance while the concluding section brings the work to end in Brahmsian solemnity. A feast for unashamed romantics. Grand Romantic, heart-on-sleeve stuff, over the top music, delivered in bravura performances by Derwinger and Rasilainen. Another winner in this splendid cpo Atterberg edition.